Having the right equipment in a shop means that the job will get done correctly, accurately and precise. This can be anything from shop equipment to car parts, and the better they are built the longer they will last. Having the right Press in your shop will enable you to not only accomplish the job safely and accurately but it is designed to work well and last. This saves you on unwanted repairs later on, which can be costly both to the machine and to the work production of your shop. 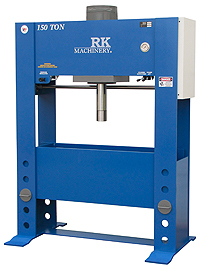 The 150 ton press is built and designed by the right people at RK Machinery, who are not only trusted in the industry, but who specialize in building, designing, and repairing all types of presses. Designing and building presses for over thirty years gives them the experience and knowledge of building the right equipment for your needs. The 150 ton press is not only built sturdy to last, but built and specified in a way to be safe for the operator while being completely accurate on the task at hand. The 150 ton H Frame Hydraulic Press contains a self-locking design that eliminates lateral movement. 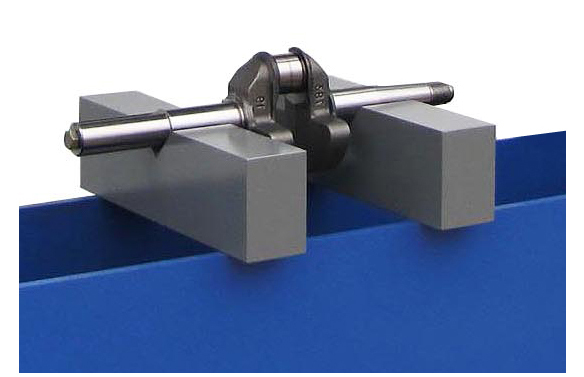 The flat Ram nose can be easily changed in order to allow the user to adapt the Press to a specific job. The electric hydraulic operation allows smooth, and consistent pressing action. Designed with several safety features the 150 ton H Frame Hydraulic Press is pressure regulated in order to control the Ram pressure. The fingertip controls allow the user complete control over speed and pressure for the task at hand. Besides being a safe and sturdy Press for all sorts of machine types the 150 ton H Frame Hydraulic Press contains a high capacity twenty gallon hydraulic oil reservoir. The low pressure hydraulic system maintains lower oil temperatures, resulting in higher efficiency and a safer operational control. All the parts on the 150 ton H Frame Hydraulic Press are industry standard making it easy to find parts, if and when you might need them. With a safe operation comes a machine that will not only last in your business, but continue to perform at a level that is above and beyond its peers. * A matched pair of V Blocks. * Front Safety Guard in order to protect the operator. * For a hands-free operational control a Foot pedal-electric solenoid valve with electric control panel can be installed. * A twenty four inch stroke cylinder.